The Ardboe Toursim Board have denied they strategically placed Ardboe’s first lamp post outside a pub to heighten suspicions of a UFO hovering over the area hence boosting much needed tourist numbers. The UFO, Alien and Paranormal Research of Strange Things Ireland (UFOAPRSTI) revealed they received 980 unique phonecalls from concerned and often inebriated Ardboe residents about a strange light hovering near the Lough within the last week. With a population of 986, concerns were also raised that all but 6 people in Ardboe spend a portion of their day in the bar. 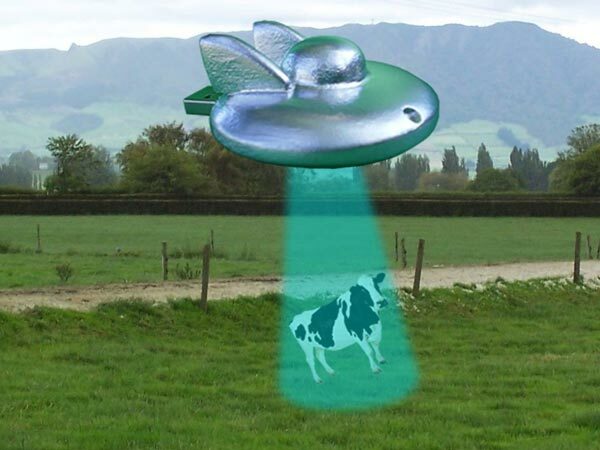 One local farmer has sued NASA for the mysterious disappearance of one cow. NASA say this has nothing to do with them. Before long, everyone in Stewartstown emptied out onto the main street (population approx. 1400) to stare at the moving object. Explanations ranged from a very fat moth to a hubcap. Within 24 hours, over half a million people descended on Stewartstown with the local pubs, shops and hostelries experiencing a roaring trade, unprecedented in the town’s history. They have since declared to be the richest town in Ireland with Fergal Logan as their first Lord Mayor.